Things are off and rolling with home improvements. Furniture shopping has been challenging thus far so I have been excited to make some easy and affordable changes. 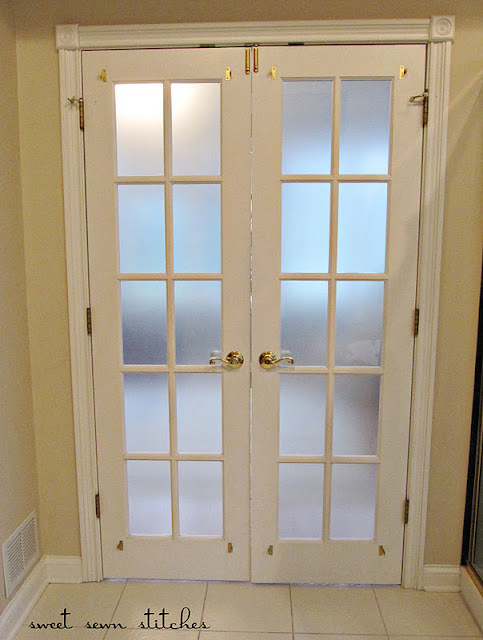 I have seen simple contact paper used to frost windows and doors to add subtle privacy. 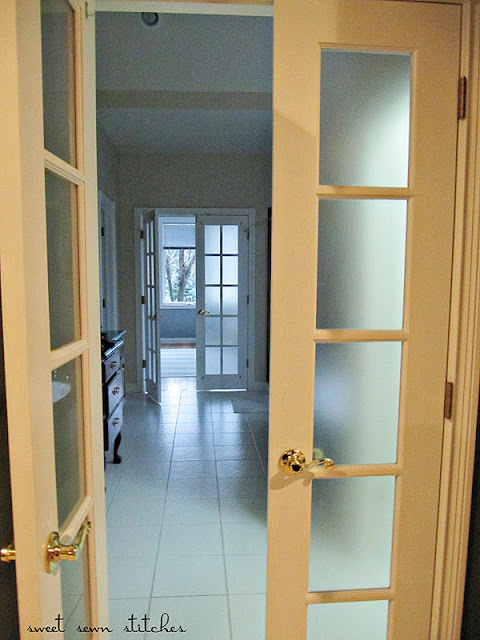 The master bathroom is sandwiched between the master bedroom and the sunroom. 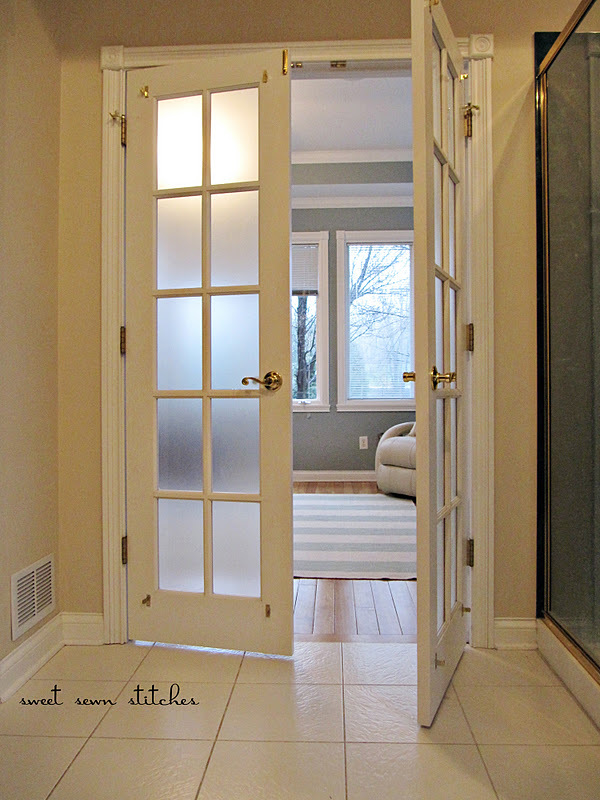 This different layout paired with glass paned doors, while gorgeous, create a privacy issue. 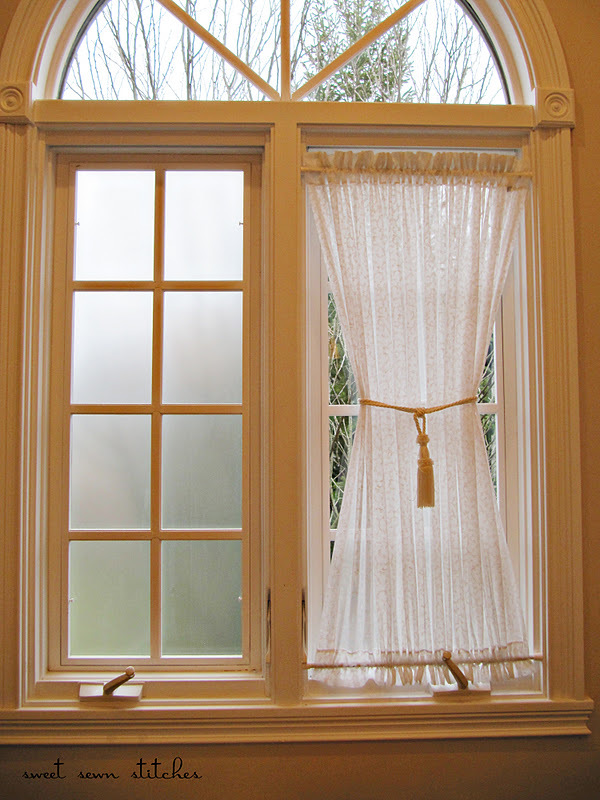 When we moved in, the doors and window in the bathroom featured sheer, floral embossed curtains hung with tension and mounted curtain rods. The treatments were not horrible, but once I had the idea and vision of frosting the glass I knew it would look so much better! I purchased three rolls of basic contact paper. I measured each pane and cut the contact paper to size. I researched the best way to apply the paper and decided on this method. 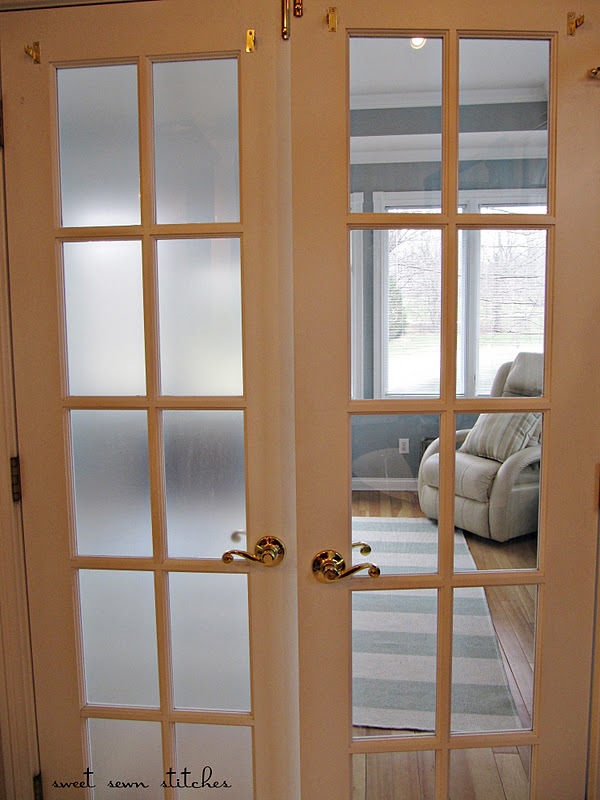 Clean and dry the glass, spray a coat of window cleaner evenly, peel off contact paper backing, and apply to glass. The cleaner allows more control of paper placement. Position paper and then use a pot scraper to ease out the bubbles. This method did not work on the first attempt...or the second. It was time consuming, frustrating, and while trying to remove bubbles, my scraper was causing streaks in the paper. It looked horrible! I took a break and expanded my research to look for application instructions from more professional window film products. I found a great review on Amazon that offered a different method using dish soap and a shower glass squeegee. The process was very similar, only dish soap and water was used rather than window cleaner. It worked perfectly and the application of all 32 glass panes was not as intimidating. Because the window film is in a bathroom, I applied the paper to the outside of the glass doors to avoid any possible problems due to shower steam. 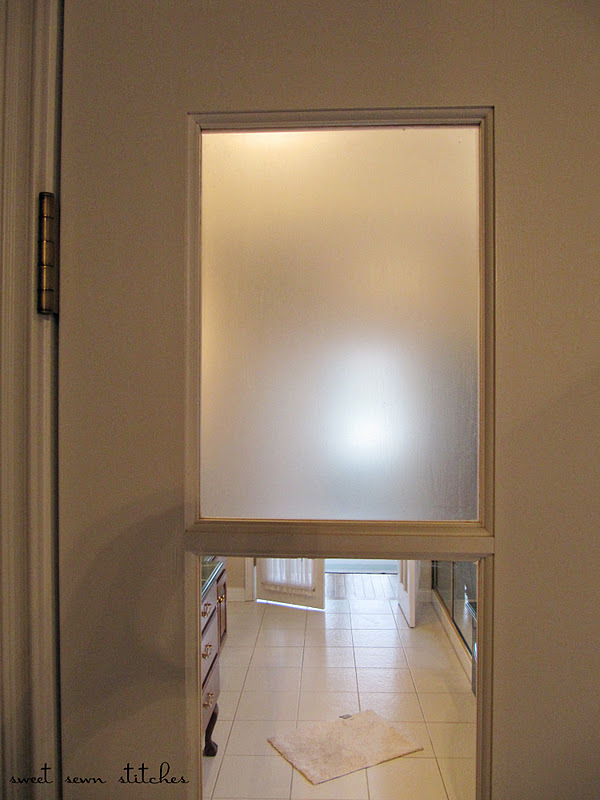 The window film was applied inside, but so far steam has not altered the application or appearance. The project was time consuming and tedious, but well worth the work! I love the subtle privacy it offers. Removing the curtains makes the bathroom look more open and airy and I also really enjoy seeing the architecture of the doors and windows. I hope this inspires you to make a small and affordable change to your space! what a great idea - amazing that you managed it without bubbles under the foil. That looks sooooo good! I need to do this in my front entryway- I hate it that people can see into my house when they come to the door! Looks great! I need to do this on the windows in our bathrooms. All three bathrooms have a window directly in front of the toilet. How wierd is that! Looks great! Very nice work. The window cleaner application method does work, you just need to give it some time to settle and the bubbles and streaks will go away. But its good to know about the dish soap method too! Oh this is so LOVELY... I am really loving these Contact Paper Glass Window projects... You did an Amazing job!!! Love it. It looks really good. 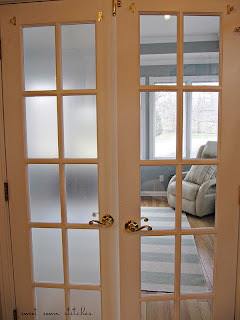 I wonder if I should do this for my sliding glass doors. Thanks for the inspiration! The doors look fabulous. I have a low window in my master bathroom that has created some similar privacy issues. I think you've just solved my problem! Thank you! Such a great way to do this! I had my windows tinted on my car, to help with light sensitivity, and they used johnson and johnson baby shampoo mixed with water, and a squeegee. So smart!! I need to do this to some of my doors! I am featuring this at somedaycrafts.blogspot.com. Grab my "featured" button. Oh wow, what a difference. I had no idea you could use contact paper. I purchased decorative film at Home Depot for $21 a roll. Using contact paper would have saved me so much. Thanks for sharing. I did this to my bedroom windows. I have just shear curtains up and I love how much light comes into my room but it is in front of my house and I was having major privacy issues. 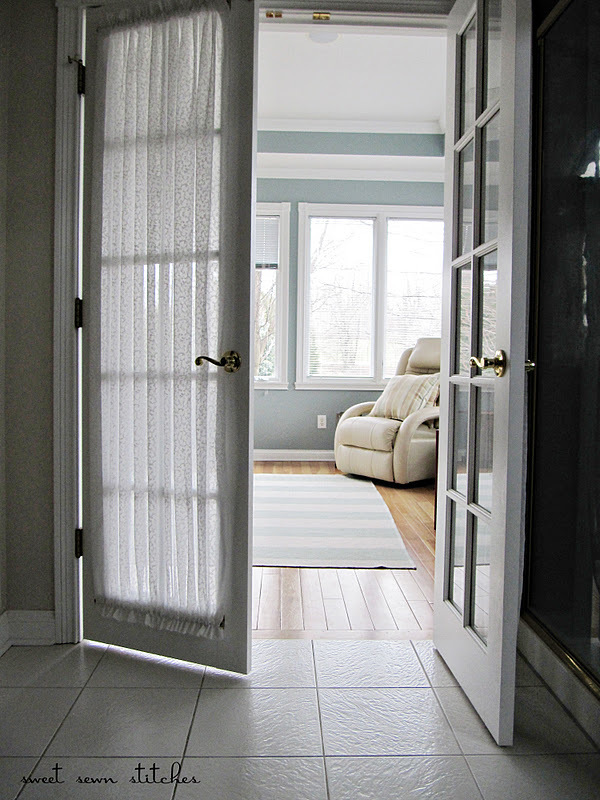 I was thinking about hanging blinds but then saw something similar to this somewhere else and decided to try it. I didn't apply anything to the window before hand. I just put it up just on the bottom half of my windows and it works and looks great and I still have all my light. I love the look of this, I want to give it a try now! Very nice! Quick question, did you cut the rectangles of contact paper to the exact size before applying them, or did you have to trim the edges after they were on the glass? Thanks! In most cases, I cut to exact size and any extra was able to tuck behind the 'cross' frames of the door. You could also trim with utility knife, but once the contact paper is on the surface it's fairly slippery to be able to cut cleanly. Hope this helps! Yes, I'm going to do this Too! Thanks for the tips! Thank for sharing at Creative Juice last week. I have a cabinet that I am using this idea on! I'm featuring you this evening, and pinning/tweeting/facebooking this post as well. I love it! Too bad my windows are all slider doors....but that would be a cool idea! Maybe someday I'll do it. So you used regular clear Con-Tact paper? I have scads of that sitting around here, but yours looks frosted (mine doesn't). I really want to do this to our entry door, so I can't wait to hear back. I just did this today and got my contact paper from the dollar store! So many pretty styles and colors....I didn't use the Windex so it was much more time consuming and I measured and cut my pattern with typing paper I taped together...Got it pretty accurate and looks good now too!